ECS Liva Core. 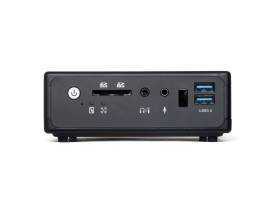 Silent Core M mini PC specs gallery and video. We’ve got two fanless Core M mini PCs to add to the mini-PC database now. 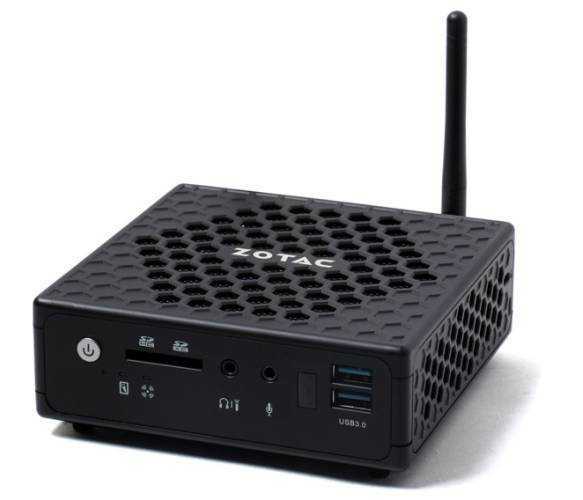 The ECS Liva Core is now official and goes head-to-head with the Zotac Zbox ZI521. The design is very unique with its see-through top panel and the port selection good too although I don’t see any consumer IR support. The front-mounted ports seem a little over the top too. Surely a single USB and audio ports would be better? 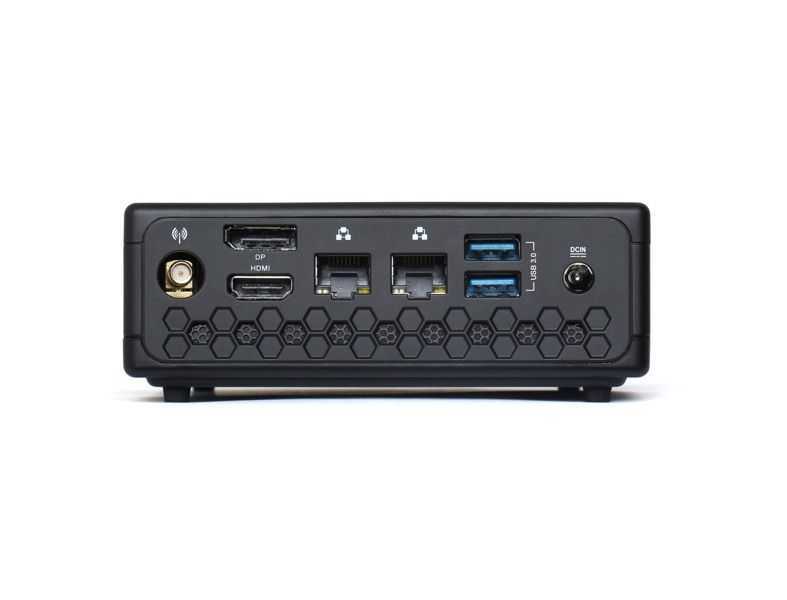 At the rear you’ll find another USB 3.0 port, Gigabit Ethernet, 2 HDMI ports and a headset port. There’s no dedicated digital audio port. 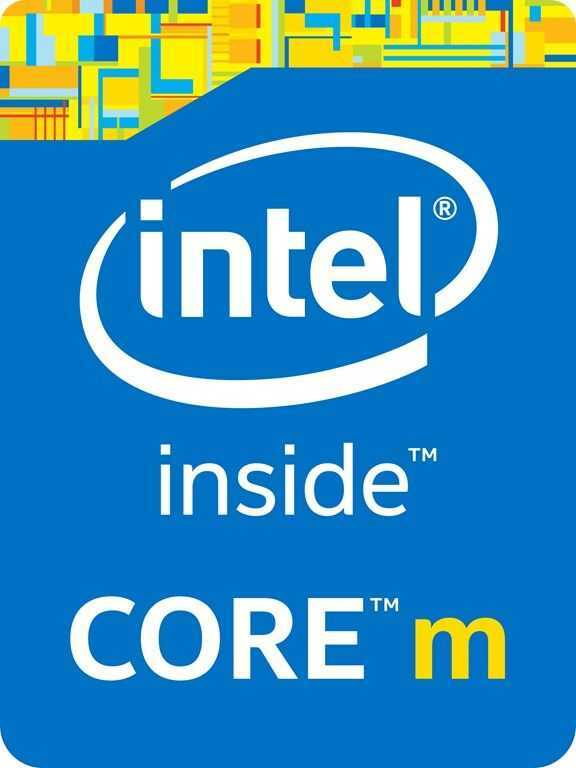 Intel Core M will enable differentiation without compromise. Intel’s Core M reminds me of a moment in 2008 when I briefly tested a Samsung Q1 Ultra Premium. It was one of the few UMPCs around that used a Core Solo processor instead of the very low-end pre-Atom CPUs and it was a breakthrough in handheld PC performance. Core M is going to allow manufacturers to make exactly the same sort of breakthrough from ‘just enough’ into mainstream performance on a handheld PC except this time it’s fanless. Core M is going to be the first CPU that allows manufacturers to make different types of tablet PC without the compromises of size, heat and noise that have been associated with previous high-power Windows tablets. 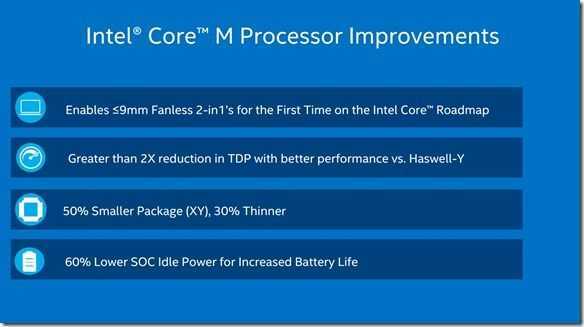 That much was clear from early information we got about the Core M / Broadwell Y processing platform at Computex. A 600 gram 10-inch tablet running ‘Core’ without fans is special but yesterday Intel gave us more details about how they’ve achieved performance, sizing and TDP improvements. Before we sing the praises of fanless Windows tablets too loud let us consider the Surface Pro 3 vs the HP Pro X2 410. Both of these use Core i5 CPUs but the HP Pro X2 is fanless. It also gets hot and throttles the performance so much that you can easily get into situations where an Atom-based tablet might be better. The latest Core CPUs use thermal measurements to calculate short-term CPU overclocking but if the system gets too hot, you end up with an under-clocked system. It means that the Surface Pro 3, which has a quiet fan, is much, much more powerful than the HP Pro X2. Fanless systems can be a disadvantage. We don’t quite know how much Core M devices will be affected by throttling yet. Larger devices with more airspace, and I expect to see some interesting 12-13-inch designs soon, will have the advantage over thinner designs with less ‘thermal headroom’ but leading edge designs may be able to squeeze more out of the platform. This slide from Intel is really worth studying. In it you can see how device thickness impacts on the TDP limits. At the extremes, that’s with a 7mm thick 10-inch design, you’ve got just 3W of TDP to play with. 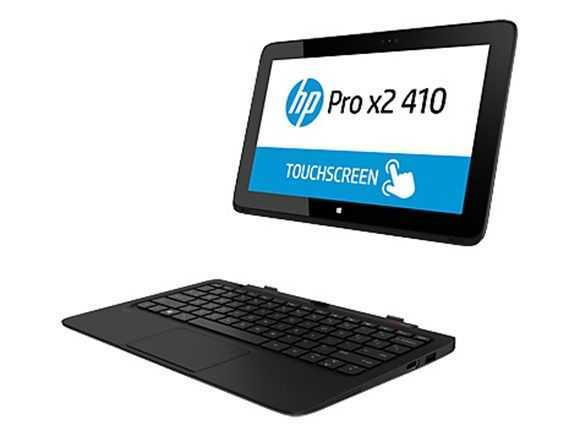 Ambient temperature becomes more critical too and I demonstrated that with the HP Pro X2 410 in my review at Notebookcheck. What is certain though is that in terms of marketing, Core M-based fanless Windows tablets will offer some real differentiators. Light weight, thin designs, silent operation and, you can be sure, 1.6-2.4Ghz clock ranges will sound impressive. Underclocking to 600Mhz won’t be in the list of features though so we’ll have to look carefully at the first tests. 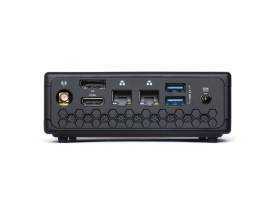 I’ll certainly be looking out for this when I attend the Intel Developer Forum in September. Core M tablets and 2-in-1s will be high-end devices. They need to be to cover the costs of this leading edge CPU on its new manufacturing process. 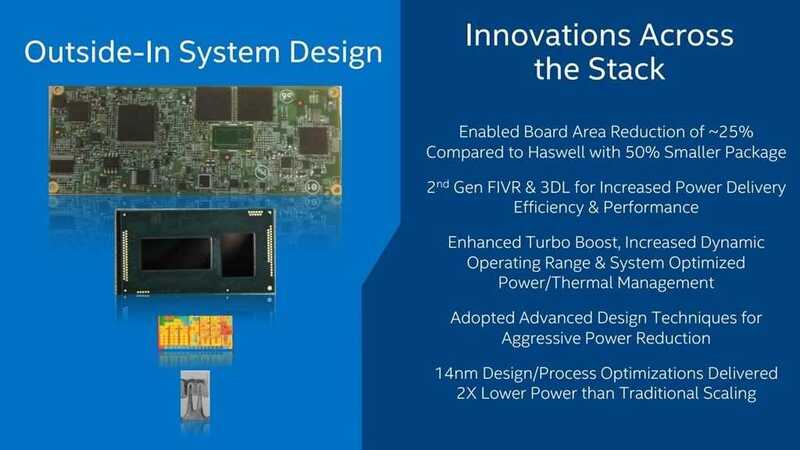 Although Intel says that the “14 nm product yield is now in healthy range” and that considering the 14nm process produces more chips per wafer you can guarantee that Broadwell-Y will have lower yield than other SKUs. Each one will have to be carefully tested to see if it meets Intel’s standards. Those high-end devices will offer some nice features though. Although there are Atom-based platforms that offer reasonable Gen-7 Intel graphics and Intel Quick Sync video hardware the CPU and video processing here is going to be in another league. It’s not desktop-gaming capable but it’s certainly going to enable fast ‘Pro-Am’ 1080p video editing and rendering. GPGPU acceleration for HTML5 is also likely to be in a different league meaning the ever-important Web applications will be faster. Given that gaming capability is not a key feature the platform would match requirements for a high-end Chromebook quite nicely. There’s power here for some impressive X86 Android gaming experiences too and we shouldn’t forget that Core M won’t be just for Windows, at least when the pricing comes down. In terms of battery life Intel have revealed a few features and optimisations that could help significantly in some scenarios. Video playback and typing, as I’m doing here, should get a significant battery-life boost from the optimised power control elements in the new platform. TDP is said to down by up to ‘2x’ (meaning 3W TDP SKUs are probably in the pipeline) for the same performance level. That’s impressive. Due to die size reductions there’s more space for battery too although it’s likely that some of this space needs to be used for airflow improvements. Given the cost of batteries I wouldn’t expect any increases. On the contrary, you might see battery sizes reduce on the lower-end and thinner products. 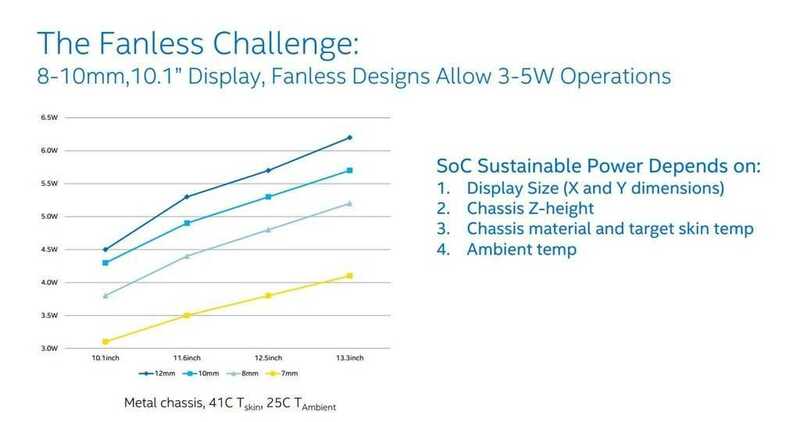 You’ll find a detailed analysis at the new Broadwell architechture over at Anandtech so don’t forget to check that out too. In summary the Core M range of SoCs, like other ‘Y-series’ or ‘SDP’ oriented designs will offer a lot to the designer and a lot to the marketing manager and we’ll have to be careful to analyse what this really translates to in terms of performance for power users. 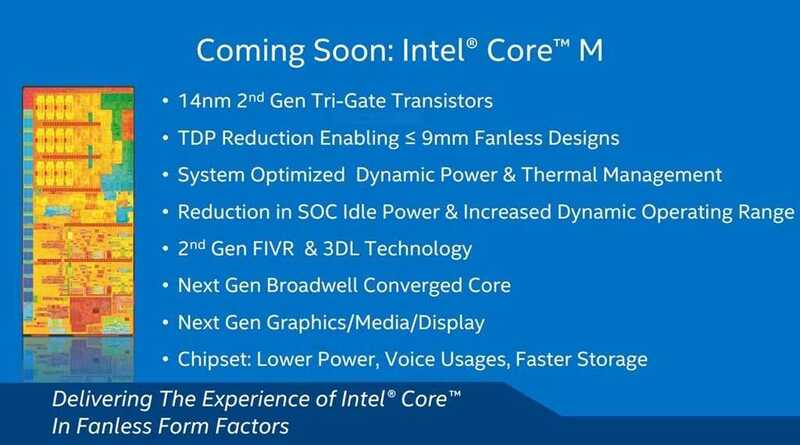 There may not be enough in Core M to run a complete daily desktop experience and for consumers, the prices could be high but thin and light fanless designs are critical and it looks like Intel have enabled a product range that can offer that. Given some good, showcase designs – and the ASUS Transformer Book Chi could be one of them – there could be enough here to elevate Intel-based tablets into a unique position and that’s exactly what Intel need. 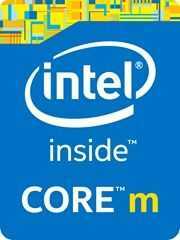 Core M is the differentiator-enabler. Source: Intel. Press materials are here. We saw the Llama mountain 12.5-inch concept announced at Computex yesterday. 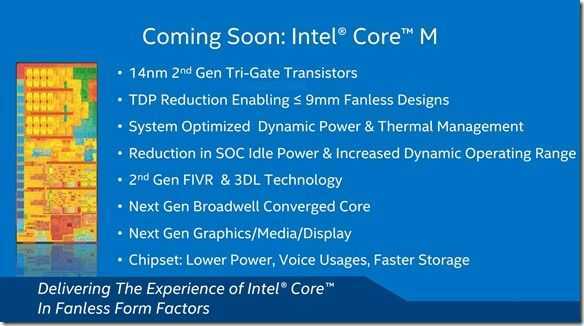 Its 7.2mm fanless design is enabled by the new 14nm Broadwell-Y based Core M branded CPUs. Today at Computex Intel demonstrated a 10-inch version of that dockable tablet that weighs just 550 grams (1.21 pounds.) That’s as light as any Atom-based 10-inch Windows tablet we’ve seen to date. The thickness is just 6.8mm. This is a breakthrough. A Core-powered fanless tablet at a consumer-friendly weight. This is only a reference design but it’s working and obviously something that OEMs will be working with to help them produce interesting 2-in-1 and tablet products for Q4 this year. We’re trying to track down some images of the Llama Mountain 10-inch design so check back for more info as we update. Intel also announced a new RealSense SDK, a new developer kit, new developer competition and a lot of applications that will be RealSense-enabled. More info on RealSense here. The press release is here. No information was given on the next-gen Windows tablet platform, Cherry Trail. 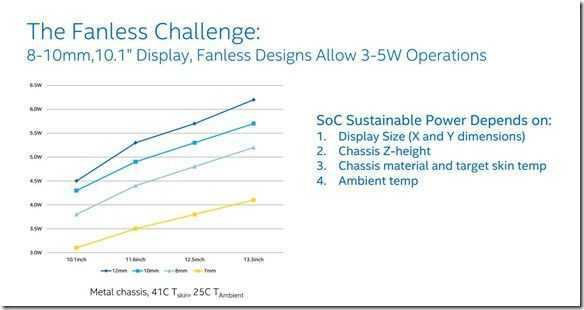 ASUS Transformer Book T300 Chi is a Broadwell Teaser. Impressive. The Transformer Book Chi 2-in-1 was shown briefly at the Computex show today and although Asus didn’t say it outright, the ‘next generation’ Core processor, slick design and lack of detail in the specifications availability and pricing leads us to conclude that it’s going to be a product built around the 5th-Generation core. It means we’ll probably see this on stage a few more times before we get to see it for sale. The incredibly thin 7.3mm tablet design is just 14.3mm thick when snapped together with the keyboard. The weight should be just as groundbreaking. The design suggests that it’s fanless too. HP Pro X2 410 G1 First Impressions. Fanless Core i5: Like, Weight: No Like. 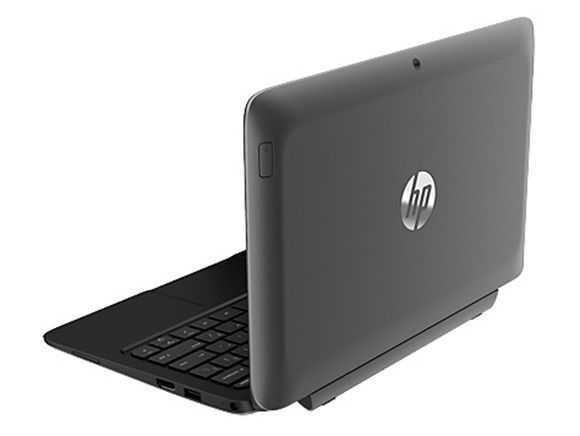 I’m reviewing an 830 gram / 1.83 pound 11.6-inch Core i5 Windows tablet for Notebookcheck.net this week and after 24 hours I’ve got a good feeling for where this HP Pro X2 410 G1 is going. There are some really impressive specs and performance figures here but they’re sitting alongside some fundamental issues. One of those issues always will be an issue and it’s something that also affects the Surface Pro 3 that was launched this week. Weight. The Pro X2 proves to me once again that large format tablets need to be exceptionally light to be truly useful. Yes, there are some of you out there that have a need for a powerful tablet and I accept that you’re happy with a trade-off, but there’s not many of you – especially when this has a 1366×768 screen, doesn’t lean back far enough in the dock to allow ‘lapping’ (because the tablet weighs too much and it would tip over) has no tablet stand and doesn’t have a digitizer layer. Total weight: 1.6KG. The really sad thing about this design is that internally it’s looking very good indeed. I’ve just tested the SSD and seen some amazingly good speeds. 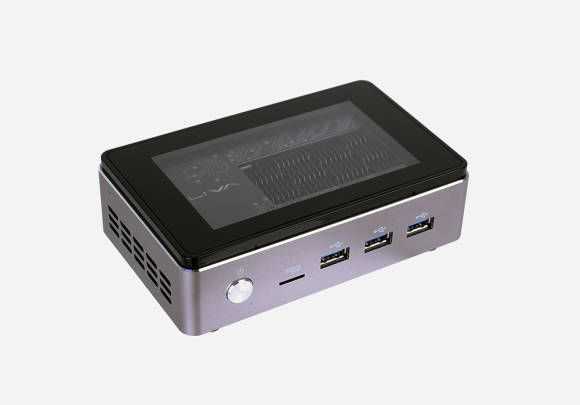 The speakers are great, the backlight is strong, build quality is good, keyboard is great, there’s a total of 50Wh of battery and that Core i5 (4202Y) is running fanless. This is great electronic engineering. I’ve never had so much fanless PC power in my hand. HP are pitching this into the business market but I’m struggling to see any major demand for it at the price they’re asking. Over $900 / 900 Euro for a Core i5 with 4GB and 128GB SSD. You can get more power, in less weight, with a recent Ultrabook. Go for a 256GB SSD option on the HP Pro X2 and the Surface Pro 3 looks like a much better option, especially as you get the digitizer and 8GB RAM. I believe in 2-in-1s. I believe that one day the technology will allow us to build some amazingly light large format mobile screens that have the power of todays mainstream PCs. It might take a next-generation wireless display technology (WiGig is one to watch) or it might take a ‘screen as SoC’ technology to get things slimmed down but the modular approach seems like the sensible option. Right now the 11.6-inch screens are too big for workable 2-in-1s which means that 10-inches is the way to go right now. Truly table-top productive 2-in-1’s may take a few more years. I’ll be continuing my HP Pro X2 410 G1 testing over the next week and you’ll probably see an overview on the YouTube channel in a day or two. Maybe the performance will win me over. Maybe I’ll find a hot-desk scenario that wins me over. Maybe that battery life (I’m expecting 8hrs of productivity) is the key. Maybe there’s enough in the laptop part (the keyboard sure feels good!) that the tablet part is just a bonus. Maybe the fanless aspect is good enough to make it unique for schools or some vertical that I can’t think of now! We’ll see over the next week but if you have any scenarios you think might work for this, let us know in the comments. Thx Notebookcheck for allowing me some personal time with the HP Pro X2 410 G1. You can check out their reviews here.